Synopsis: This paper aims to give beginners in continual improvement an idea of what process behaviour charts are and how easy it is to put them together. For a complete understanding of process behaviour charts, including what type of data can be used, how it should be collected and interpreted, we recommend reading one of Don Wheeler’s books listed in the Bibliography at the end of the paper. We have already discussed the importance of identifying the two types of variation in work processes and organisational systems (see the “Understanding Variation” white paper). We will now explore a simple statistical method for assessing what type of variation is present in a given process. This method is called the process behaviour chart, traditionally known as statistical process control (SPC). If the mention of statistics should make you feel nervous, don’t go away just yet. The knowledge we are about to outline here can be easily handled with everyday numeracy skills. It is true that process behaviour charts used to be the complicated part of continual improvement. At the time Deming was developing his approach to management, one had to get to grips with about half a dozen different types of charts. Over the last couple of decades however, thanks to the contribution of Donald J Wheeler PhD, the statistical side of continual improvement has become a lot more accessible to everyone. Donald Wheeler specialises in business and management applications of statistics. He has proven that one type of process behaviour chart - the one that we will outline in this paper - does the job in most situations. Before we go through the steps required to build a process behaviour chart, let us review two very simple statistical concepts. One is the average, which is widely used and understood. The second one – less commonly known, but just as easy to grasp – is called the moving range. The average is calculated by adding up all the given numbers and dividing the sum by how many numbers are being averaged. The moving range reflects the distance or difference between two consecutive points. We calculate it by subtracting the smaller value from the larger value of each pair, as in the table below. The symbol used for the moving range is “mR”. And that is pretty much the level of statistical knowledge required for understanding the most common type of process behaviour chart, which is called the chart for individual values and a moving range. Or XmR chart for short. What variables could we chart? It could be the number of customer complaints your organisation recorded within a month, or the number of visitors to your website each week, or the number of days a local authority takes to answer each planning permission application submitted to them. The list is practically endless. If we collect the values of any such measures over a period of time, we will then be able to plot them on a chart in chronological order and get a picture of the variation. 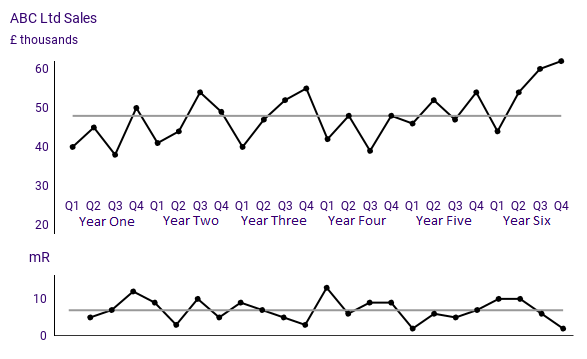 Step 1: Plot the run chart of the variable you are interested in. A run chart is a graph that displays the observed values of a variable in a time sequence. 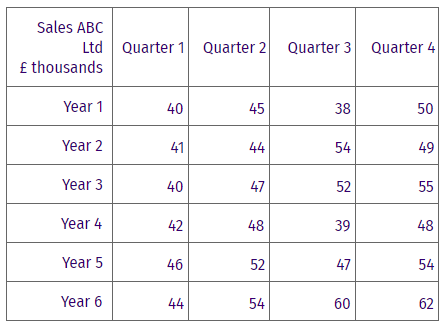 The table below shows the quarterly sales values for a small business - let’s call it ABC Ltd - recorded over 6 successive years. We have rounded the figures down to the nearest thousand. 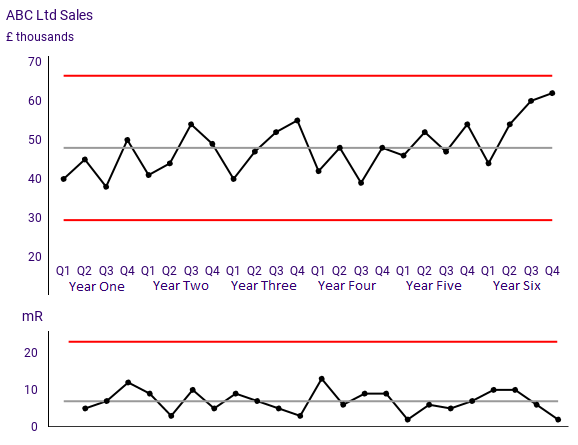 Figure 1 shows the same sales figures plotted on a run chart. We can tell by looking at both the table and the run chart that the last two quarters are better than any other across the six years. For the first time since they began trading, ABC Ltd have reached quarterly sales figures of over 60 thousand pounds. The result is of course to be celebrated. There is also the question of how significant the last two quarters are in terms of business growth prospects? Do they indicate a change in the process, or is it just routine variation? Can we expect a growing trend to set in? What should ABC Ltd’s sales forecast be for the year ahead? You will notice we are not talking about setting ‘aspirational’ sales targets and giving the sales staff a stretch. What we need to know is how strong an expectation of growth the management can realistically form. Do we need to be well prepared for an increase in business activity? Will we need to increase capacity, hire more staff etc? Building the process behaviour chart will give us answers to these questions, answers based on the dynamic of the process itself, not just on hopes and aspirations. Step 2: Calculate the average for the given collection of values (X). The average will become the central line of the graph, as in Figure 2. In our example, the sum of the 24 sales values recorded in the graph is 1,151. Dividing the sum by 24 will give us an average X of 47.96. Step 3: Calculate the moving ranges (mR) for the data. The moving range is the difference between two successive values. By definition, the moving range is a positive number, so we disregard any minus signs. Step 4: Calculate the average moving range. In our example, the sum of the moving ranges is 160. We have 23 moving ranges in this case, so we will divide 160 by 23 and obtain an average mR of 6.96. The moving range graph is useful when analysing the behaviour of a process. We will display it right under the graph of the X variable, as shown in Figure 3. Step 5: Calculate the Natural Process Limits. If our variable can only take positive values (sales figures are a good example), a negative lower limit would be replaced by zero. In the current example, the lower natural process limit has a value above zero, so we will plot a LNPL of 29.45. Now that we have calculated the natural process limits and the upper range limit, we are ready to complete our XmR chart. It will look like the graphic in Figure 4. The natural process limits and the upper range limit are drawn in red. If our data contains one or several very large moving ranges, it could give unduly wide natural limits to the process. In that case, it is advisable to use the median moving range instead of the average moving range. To find the median, we arrange the given numbers by value. The number in the middle is the median. Example: The median of 5, 8 and 2 is 5. If there are two numbers in the middle, then their average will be the median. Example: To find the median of 5, 8, 1 and 3 we rearrange the numbers in ascending order, that is 1, 3, 5 and 8. There are two numbers in the middle: 3 and 5. The average of 3 and 5 is 4. So 4 is the median in this case. When using the median moving range, the formulae for calculating the natural process limits will contain a different scaling factor: 3.145 instead of 2.66. In our example of quarterly sales figures, the median moving range is almost identical to the average moving range (7 compared to 6.96) so we will keep the limits based on the average mR.
What kind of data belongs on an XmR chart? The measurements that produce the values are consistent i.e. we measure the same thing and by the same method. The values are logically comparable - to the best of your knowledge, they come from the same system of causes. This is, in fact, the hypothesis we are testing by building the chart. If we already know that the data come from different systems of causes, then there is nothing to test. If we are plotting a time series, the data must be arranged in chronological order (so we need to make sure the time of the measurements is recorded). What we must not do is to arrange the data in increasing or decreasing value order. Ideally 24 points or more, but the limits begin to solidify after 17 points. It is possible to build a chart with fewer points. Just be aware that the fewer there are, the more tentative your conclusions will be. Interpreting a process behaviour chart begins with a visual examination of the run chart. Plotting data on a run chart has an immediate benefit in itself (even without calculating limits), as it is a lot easier to assess data in a graph than in a table, especially a table with a lot of figures in it. As soon as we have generated a run chart, we can begin to see patterns and cycles in the data. Examining the run chart in Fig. 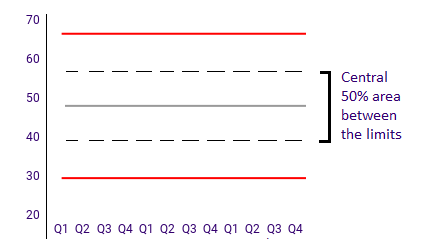 5, we notice that the first half of the points are positioned on or above the average line, while the second half are clustered around the average line, with many of them underneath. It appears that something has changed mid-way through this process. In fact, it looks more like two processes. In this situation, we would calculate the averages and the process limits separately for each half of the data, as shown in Fig. 5.b. The process behaviour chart in Figure 6 shows the performance of two teams working on alternate shifts. On closer examination, it turned out they had a different understanding of their task, which explains the differences in performance and the seesaw appearance of the graph below. The very wide limits resulting from this dynamic make it impossible to see any exceptional variation, so we must remove the noise before we can analyse the process. We do that by separating the points coming from the two different systems of causes and plotting a separate chart for each set of values. The graph below shows the daily takings of a retail business. The footfall in their shops varies greatly from Monday to Sunday, and this is reflected in the takings, with Saturdays and Sundays typically being the best days. 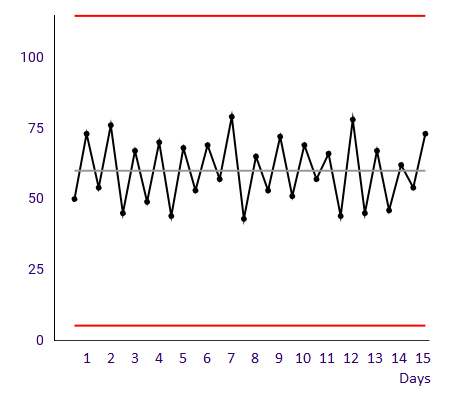 The weekly variation in this graph is not a signal. The point above the upper limit you can see in week 4 is not really exceptional variation. It is within the normal range for weekends (as we could easily verify by plotting the Saturdays & Sundays separately). The problem with this graph is that it is not comparing like with like. 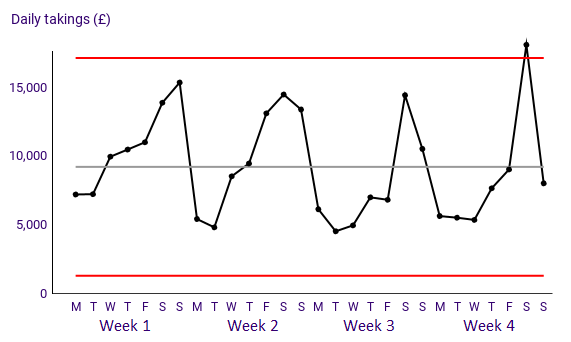 We need to look past the noise of weekly variation if we are to spot any relevant patterns in the data. The easiest way to remove seasonality in this case is to chart sales per week instead of sales per day. If we are dealing with yearly seasonality, aggregating the data by year will not be a solution, as we would need to wait for many years before collecting enough points for a process behaviour chart. The good news is that there are techniques for deseasonalizing the data, which we can use in this type of situation. See Don Wheeler’s book “Making Sense of Data: SPC for the Service Sector” for deseasonalizing techniques. We begin by examining the moving range graph, checking if any point is above the upper range limit (URL). If there is, that will indicate an exceptionally large point to point variation and we should look for an explanation. A single point outside the calculated natural process limits indicates the presence of an exceptional cause that has a dominant effect. This rule applies to X charts and - as we mentioned above - to mR charts as well. Eight or more successive values all on the same side of the central line may indicate the presence of an exceptional cause that has a weak but sustained effect. Note: Several decades back, the run of eight rule used to be “the run of seven” (originally published in 1946). Since 1956 however, all the competent sources have been in agreement that seven points on one side of the central line are an insufficient signal. If you find “the run of seven” in any literature, bear in mind that it is the obsolete version of the the run of eight rule. Three out of four successive values all within the upper 25% of the region between the limits, or all within the lower 25% of the region between the limits, may indicate the presence of an exceptional cause that has a moderate but sustained effect. Note: Two other detection rules (defined in terms of one- and two-sigma) can be found in specialist literature. Don Wheeler proposes the set of three given here as sufficient for identifying special cause variation. For that reason, we will not describe the other two rules in this paper. Applying more rules than necessary is in fact counterproductive, as it leads to overreacting. 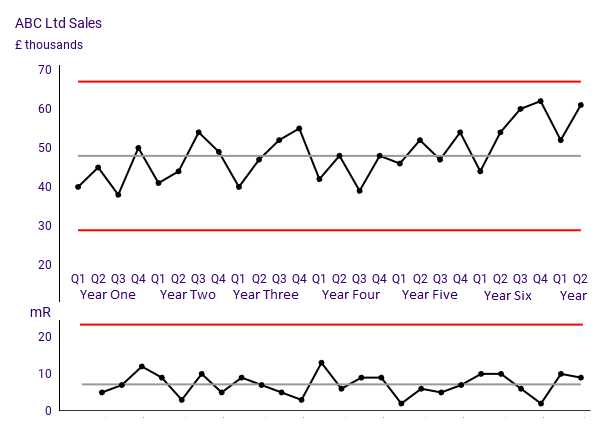 We will revisit the example we used at the beginning of this paper, the quarterly sales figures of ABC Ltd and bring Figure 4 to your attention again. Now that we know the detection rules, what can we learn from this graph? There are no points outside the limits on either the X chart or the mR chart (so Rule No 1 does nor apply). The Rule of Eight does not apply either. What about Detection Rule No 3? We notice two successive values in the upper 25% region below the upper limit, but we would need three points up there to have a signal that the process might be shifting. Great as the last 2 quarters’ sales performance is in itself, we do not have the data to indicate a growing trend. The process we are looking at is a predictable one, so it is likely that any new values will fall between the natural process limits shown on the XmR chart. What should we then forecast for the following quarter? 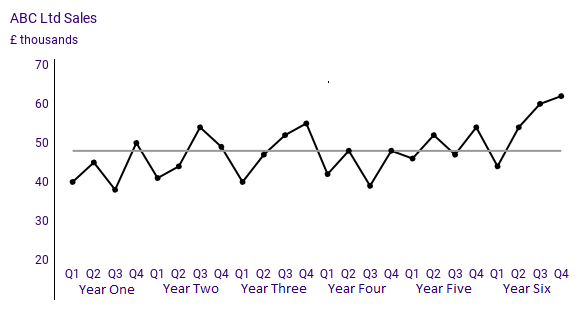 The upper natural process limit give us the best case scenario, in this case £66,000 worth of quarterly sales. Conversely, the lower natural process limit is about £30,000. That is the worst case scenario for the next quarter. Please note that getting anywhere near the best case, or worst case scenario for that matter, will probably have nothing at all to do with the sales staff being either unusually industrious or unusually lazy. This is simply routine variation within a predictable process. As for the most likely sales values for the following quarters, they will be closer to the central line than the best and worst case scenarios. This is based on the observation that most of the values generated by a predictable process fall in the central 50% area between its natural limits, as illustrated in Figure 8. Since the upper natural process limits is calculated by adding 2.66 Average mR to the central line and the dashed line is placed at only half that distance from the central line, we can estimate that the most likely interval for ABC Ltd’s sales in the following quarter will be roughly £60,000 to £36,000. Going back to the two last quarters of year six, you will remember we were one point short of a run of three near the upper natural process limit. So the following two quarters will be an interesting space to watch. Either ABC Ltd will get their run near the upper limit, in which case the forecast from then on will need to be hiked up, or the new sales figures will fall closer to the process’ average, in which case the forecast we have made above will continue to be the likeliest course of events. Would you like to know what happened next? Fast forward to the middle of the following year and we have an updated XmR chart, shown in Figure 9. What does this graph tell us? Quarter 1 of the new year did not add a value high enough to give us a run near the upper limit, but Quarter 2 did. With this new data point, we now have three out of four consecutive values in the 25% region under the upper limit. On this basis, we can expect to see a slight upward shift in ABC’s sales in the near future. We can now make another, more optimistic sales forecast, reflecting a growing trend that appears to have set in. Figure 10 below shows the same X chart as Figure 9, but with a trended central line and natural process limits in place. 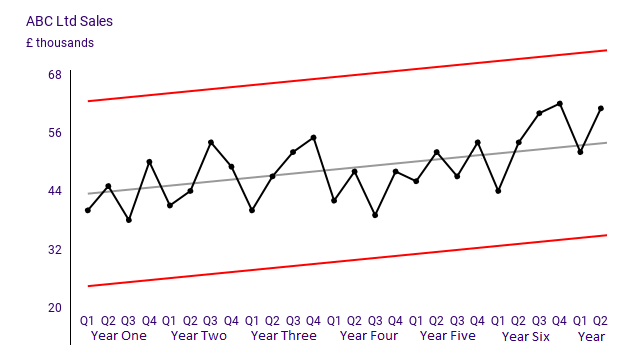 We can forecast a likely average quarterly sales figure within 64 to 45 K, with a best case scenario figure of about £73 K and a worst case scenario of about £35 K.
Note: How to calculate trended natural process limits is beyond the scope of this article, but we included the example in order to illustrate how much potential the process behaviour chart has as a forecasting method. For a straightforward explanation of trended averages and limits consult Don Wheeler’s book "Making Sense of Data". An important point to keep in mind when interpreting process behaviour charts and making forecasts is that the conclusions are always based on a ‘all else being equal’ assumption. If the market conditions change, or some other significant happening knocks ABC Ltd’s sales process out of its historic behaviour, our forecast would be invalidated. The future chart will then represent a process that has become unpredictable, due to an exceptional cause of variation. The benefits of using process behaviour charts fall into three categories: diagnosis, prediction and evaluation of process improvement actions. Find out when a change has occurred in a process and whether a process is predictable or not. Assess a process performance against a requirement e.g. customer demand and expectations. On the basis of this diagnosis, depending on whether exceptional variation or routine only variation is present, you will be able to decide what type of action is necessary to improve the process. Armed with the process behaviour chart, you can avoid the trap into which so many managers fall, of reacting to routine variation as if it were exceptional, with all its dire consequences, from alienating your staff and customers to creating outright chaos. In stable processes, calculating the natural limits will give you a sound basis from which to predict the range (minimum and maximum values) within which future measurements will fall if the conditions do not change. Process behaviour charts are a sound method for testing the effects of an improvement action you are planning to implement. Has your change made any significant difference to the process? Has it made it better? Or worse? Testing on a small scale first will ensure you don’t waste resources on a change project that will not deliver improvements. This approach fits the Plan-Do-Study-Act cycle widely used in continual improvement. Process behaviour charts are used at the ‘study’ stage and will provide sound evidence based on which you can decide whether to go into full implementation or back to the drawing board. Process behaviour charts are indispensable to competent management. They provide essential insights into work processes. A wider use of this simple but powerful statistical method would avoid many mistakes currently made in the management of business and public sector organisations. While the statistical method is easy to grasp, the interpretations are rich. So we encourage you to read one of Don Wheeler’s books listed below and check on the many real life examples he describes.